‘Walking together on the way’ is the title of a new document to be published by the Anglican-Roman Catholic International Commission, whose members met this month in Erfurt, Germany. 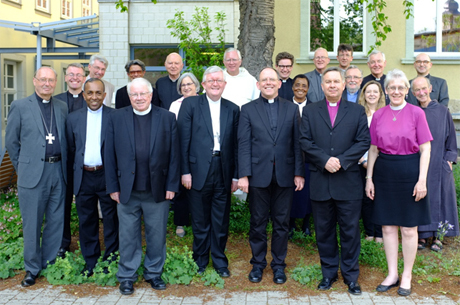 Despite some “difficult conversations” and “hard questions” over the past year, the Anglican and Catholic theologians who make up ARCIC III managed, at the May 14th to 20th meeting, to conclude the first part of their mandate, finding agreement on ways in which the two Churches are structured at local, regional and universal levels. The new statement opens the way for the Commission to tackle the second part of its mandate on how the Churches, at local and universal level, are able “to discern right ethical teaching”. But what does the new ecumenical text contain? And how will it affect ordinary Catholics and Anglicans in the pews? To find answers to those questions, Philippa Hitchen spoke to the Catholic co-secretary of ARCIC III, Fr Anthony Currer of the Pontifical Council for Christian Unity. Fr Tony notes that the city of Erfurt was chosen for this 7th annual encounter because it was the place where Martin Luther found his vocation and entered the Augustinian order. In this year marking the 500th anniversary of the Reformation, he says, members of the group also knew they had to make some important decisions on what the document could say “about ecclesiology, about the Church as communion and […] about how our structures work within that communion”. Fr Tony says participants “asked hard questions of one another” and agreement was by no means “a foregone conclusion”, yet the encounter also produced some “very positive conversations”. By reflecting on what the Anglicans call ‘instruments of communion’ the group explored decision making at local, regional and universal level, within both traditions. Using what’s called the ‘receptive ecumenism’ model, Fr Tony explains that “each of us on our pilgrim way, trying to walk in fidelity to the Lord,” is called to examine how we “are wounded in some way”. By speaking honestly to our dialogue partners about our difficulties and shortcomings, he says, “we can learn from one another”. Asked about what Catholics can learn from their Anglican counterparts, Fr Tony points to the “processes of synodal life” including parish councils, diocesan administrations and other regional structures. Noting the way Pope Francis is calling for “a more synodal Church”, he says these are questions where “we can look to the Anglican Communion” whose structures are “a bit more developed than our own”. He also notes the “very frank and open culture of discussion about real difficult issues in the Anglican Communion”, saying “that’s something we could look to gain from”. Reflecting on obstacles to unity, such as the ordination of women, Fr Tony says the new document looks at the broader questions of ” where authority lies,” adding that decisions taken at regional level are under “a lot of pressure to move in line” with the prevailing culture of the country. Please find the full communiqué from the meeting of ARCIC III here.